The Cadillac CTS-V super sedan’s track-honed design, chassis and suspension elements complement the supercharged powertrain, providing true track capability, performance and driver control without modifications or special procedures. 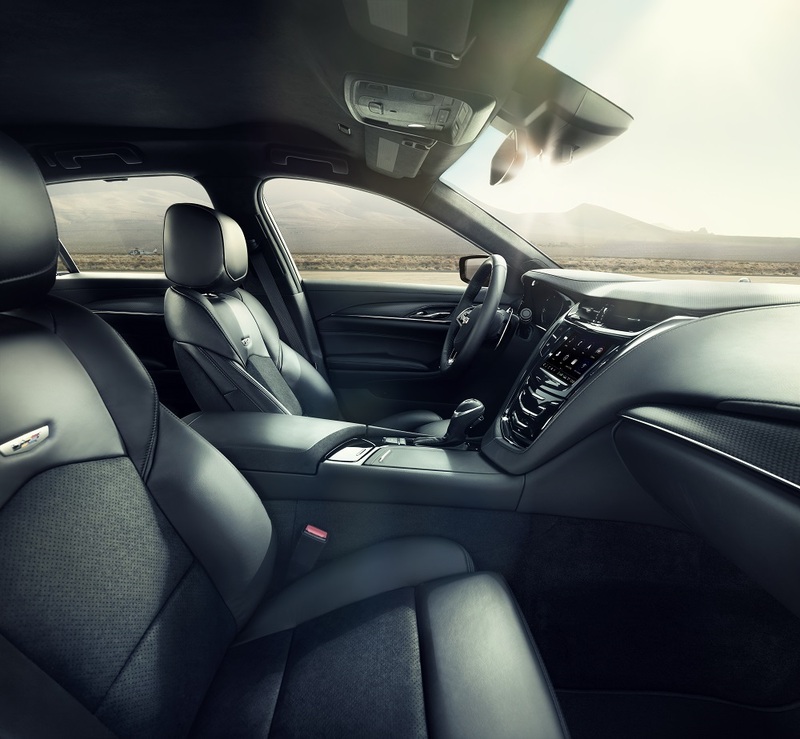 With more than a decade of V-Series production models and the Cadillac Racing program experience, Cadillac has engineered the third-generation Cadillac CTS-V super sedan to deliver greater body motion control for a more agile feel, while maintaining excellent ride quality. The CTS-V incorporates unique performance elements, components from world-class performance automotive suppliers and segment-leading, company-exclusive technology. The Cadillac CTS-V super sedan shares the same 114.6-inch (2,910 mm) wheelbase as the CTS non-V-Series models, but features wider front and rear footprints that enhance grip, reduce body motion in turns and contribute to more direct-feeling steering. The ZF Steering Systems electric power steering features 14-percent greater system stiffness for a feeling of precision and greater driver feedback. The 19-inch wheels wrapped with specially developed Michelin Pilot Super Sport summer-only tires give the Cadillac CTS-V its footprint and enable nearly 1g in lateral acceleration. The lightweight, forged aluminum wheels – measuring 9.5 inches wide in the front and 10 inches wide in the rear – are constructed of a low-mass forging that helps reduce un-sprung weight for greater agility and a more direct feel to steering inputs. In fact, the wheels are 45-percent stiffer than previous Cadillac CTS-V wheels, while the Michelin tires feature a tri-compound tread that delivers excellent grip in performance driving situations, excellent ride quality characteristics and extended tread wear. A Brembo brake system provides durability, consistency and the capability for track-day performance. The system includes 15.3-inch-diameter (390 mm) front Duralife rotors with staggered six-piston calipers and 14.3-inch-diamter (365 mm) rear Duralife rotors with four-piston calipers. Segment-best, third-generation Magnetic Ride Control "reads" the road a thousand times per second, sending data to magneto-rheological fluid-filled dampers that can independently control the damping characteristics of all four dampers. Third-generation improvements enable 40-percent faster damping response. In fact, at 60 mph, the third-generation Magnetic Ride Control system calculates the optimal damping force for every inch of the road. Segment-exclusive Performance Traction Management (PTM) software was derived from the championship-winning Cadillac Racing program for the V-Series and implements appropriate measures of electronic assistance, matched for driver skill or road condition. Five driver-selectable modes specifically for the track – Wet, Dry, Sport 1, Sport 2 and Race – provide progressive levels of electronic assistance, adjusting traction and stability controls. The standard electronic limited-slip differential translates the PTM software to optimal traction and enables maximum corner exit acceleration. Automatically activated in all five PTM modes, Launch Control manages tire spin to optimize full-throttle acceleration from a standing start. Developed to respond to cornering and torque loads that go significantly beyond the levels experienced by the non-V models, the super sedan is almost 20% stiffer to meet high performance demands. Upper tie bar-to-rear bumper braces. A revised multi-link double-pivot MacPherson-strut front suspension delivers a quicker response and increased lateral control, incorporating "hydro" bushings, where traditional elastomeric bushings are replaced with zero-compliance cross-axis ball joints, higher-rate springs and a stiffer stabilizer bar – for 20-percent greater roll stiffness. Cadillac’s five-link rear suspension features reduced roll center migration, stronger lateral control and effective anti-squat geometry, complementing the front suspension with greater body motion control. Contributing components include stiffer bushings, new cradle mounts, higher-rate springs and a stiffer stabilizer bar. Larger prop shafts and greater half-shaft asymmetry (stiffer driver’s side shaft) mitigate power hop during acceleration.